This demo video demonstrates the high definition infrared video surveillance capability of the AHD-D7W 1080P AHD CCTV Camera. The AHD-D7W High Definition CCTV camera captures video surveillance at 1080p resolution. I have the camera mounted in the corner of our tech room for this demo. The camera is connected to a iDVR-PRO hybrid DVR that supports CCTV and AHD CCTV cameras. I turn the lights off in the room so that I can test the infrared night vision capability of the camera. I also turn this computer monitor off so that there is zero light in the room. As you can see, when the camera engaged its built-in IR LEDs, the entire room is visible to the camera even though there is no light. I turn the computer monitor back on so that I can make my way back over to the light switch. When I turn the lights back on, the camera disengages the infrared mode and starts to capture color video once again. 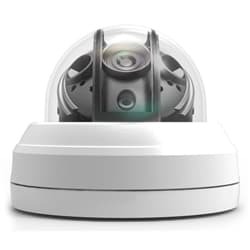 This camera uses AHD CCTV video standards and must be used with a compatible surveillance DVR. In this video, we had ours connected to a hybrid iDVR-PRO. This dome- style camera is designed for indoor use only. The AHD-D7W captures video in full 1080p resolution. The built-in infrared LEDs of the camera allow it to operate in complete darkness. The 3.6 millimeter lens provides a 90 degree field of view, which makes it a great camera to mount in the corner of small and medium sized rooms. Although ceiling mount is more typical, it can also be mounted to a wall because of the tri-axis lens mount. CCTV Camera Pros supplies this camera for home, business and government video surveillance. For more information and current pricing, please visit www.cctvcamerapros.com/D7W. Thank you for watching. Click here to learn more about the AHD-D7W 1080P AHD CCTV Camera used in this video.